Are you looking for flooring that suits the lifestyle of your busy family yet looks beautiful too? 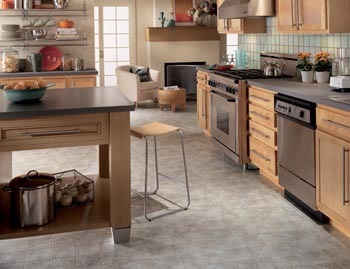 As knowledgeable and experienced flooring professionals, we recommend vinyl flooring for your home. Choose floors with modern patterns and designs or vinyl that mimics other flooring, such as wood, tile, and stone. For instance, a vinyl plank floor looks and feels just like real wood, and luxury vinyl tile flooring can be made to imitate ceramic tile. After your purchase, why not choose us for vinyl flooring installation too? By using us for quality floors and professional installation, you are sure to enjoy durable and attractive floors for many years. Vinyl floor installation is easy for the professionals at our local flooring store. Our installation technicians are dedicated employees at our store who possess training and experience in this specialty work. They take the time to prepare the subfloor properly so your new flooring adheres properly. With skilled eyes and hands as well as the proper tools and equipment, our technicians install flooring so that it is flat and smooth. Installing it correctly ensures that your vinyl floor will resist tearing and damage. Different types of vinyl come in various shapes. This impacts the installation process. Vinyl plank looks like hardwood and snaps together for a tight fit. On the other hand, luxury vinyl tile comes in squares that resemble porcelain tile. Whatever the shape of your vinyl flooring, our installation experts know the best way to install it. Rely on us for attractive floors that enhance any room in your house. Vinyl plank floors fit together much like wood planks for easy installation, maintenance, and removal. Today’s vinyl plank floors are made to lay flat and fit together snugly so that they look attractive just like hardwood. We recommend you make use of our installation professionals to lay your vinyl planks so that they are a perfect fit. An important consideration in laying vinyl planks is to make sure the subfloor is prepared beforehand. You want level subfloors with no mold or damage that impact the flooring. For your convenience, request the service of our installation experts at our flooring store. We provide thorough, friendly, and efficient services. Today’s tile reaps all the advantages of modern manufacturing and passes these benefits on to you. There is a good reason we call it luxury vinyl tile. This flooring adds a high-end look to your residential space. Install tile that resembles stone or ceramic for elegance that boosts the value of any home. One of the most popular characteristics of vinyl flooring is how easy it is to clean. These floors do not require much time or attention. Sweep, dry mop, or damp mop when needed, and your luxury vinyl tile or plank floor looks as good as new. The materials used in manufacturing vinyl make it very strong and durable. Plus, it resists scratches, scuff, and dents. Choose this flooring so you spend as little time as possible cleaning and more time doing what you enjoy. Contact us for assistance in choosing the ideal vinyl floor for your home. We proudly serve the communities of Greer, Greenville, Spartanburg, Easley and Anderson, South Carolina.